Exciting new things are coming to Disney Cruise Line’s Disney Magic for families that love to hit the open seas. At Rapunzel’s Royal Table, passengers will be treated to an all-new dining experience inspired by the beloved story of Disney’s Tangled. The restaurant will feature characters, live entertainment, themed menus, special activities and a parade to cap off the evening. All of the themed events at Rapunzel’s Royal Table compliment Tangled: The Musical, an original production running during each Disney Magic sailing. Families travelling with teenagers know how fickle they can be, but the crew at Disney Cruise Line has redesigned a portion of the ship specifically for teens ages 14-17, dubbed the Vibe. The Vibe features a new coffee and smoothie bar, video and virtual reality games, DJ spin-off activities and more in an urban loft environment. The area will be monitored by trained Disney counsellors. For the parents and guardians of the group, the Cove Cafe is a place for adults only where they can enjoy coffee and tea or get wild with wine and a cocktail. The Cove Cafe also hosts adult beverage tastings at select times. Other changes announced include the addition of Club Disney Junior in Disney’s Oceaneer Club, a redesigned Rainforest Room with steam and hydrotherapy in Senses Spa for adults and more. The new enhancements will debut on the Disney Magic ship starting March 9, 2018, on sailings from Miami. The four- and five-night sailings visit Key West, the Bahamas and Disney’s private island, Castaway Cay. The Disney Magic will be repositioned to Europe for the summer season on May 14, 2018. Imagine having your own private island. Well, Disney has done just that with its enchanted Castaway Cay. This tranquil retreat is just for Disney cruisers and embodies the perfect island paradise. I’ve often said I’d take a Disney cruise just for a stop on this magical isle. The rest of the family heartily agreed after we returned from our 3-night sail on the Disney Dream, celebrating our grandson’s birthday. The cruise itself was one fantastic experience. Food, service, staterooms and entertainment were all top-notch Disney-esque. Our first port of call was Nassau— a fun place we’ve visited in the past—teeming with Bahamian and British flavour, miles of spectacular beaches and stretches of vivid coral reefs perfect for snorkelling. Excitement, however, started to build as our ship slowly approached Castaway Cay. The tropical island hideaway located just 225 nautical miles from Port Canaveral, Florida is a stop on all Disney’s Bahamian and Caribbean cruises. Ships dock right on the island, allowing Disney cruisers to disembark directly onto the pier. A short 15-minute walk leads to unbelievable amenities, including our first stop: powdery white and sandy Castaway Family Beach. The beach area is quite extensive with points and coves along the shoreline. Trams are available for those who need them (or want to get to the beach faster) and traverse all Castaway Cay amenities. Beach towels are provided by cruise line members at the pier, so no need to pack those in your suitcase or beach bag. After securing our chairs and umbrellas, the kids scurried to the bay’s turquoise crystalline waters. Snorkeling is available to those wanting to explore the Caribbean’s undersea marine habitat in Snorkeling Lagoon just off Castaway Family Beach. Two submerged submarines from Magic Kingdom’s retired 20,000 Leagues Under the Sea attraction add an element of adventure for intrepid snorkelers. We found it impossible to resist Pelican Plunge, the 2,400 square-foot floating platform with two bending twisting water slides dropping squealing riders directly into the lagoon. A giant “bucket dump” of water delivering hundreds of gallons brought more anticipation and laughter. Four water cannons provided sharp-shooting fun with floating nautical targets. Game pavilions near the Family Beach offer a variety of sand and shaded games like volleyball, tetherball, foosball, ping-pong, pool, shuffleboard and basketball. And there are also places where each age group can hang out with their peers that include planned activities like Teen Hideout or Scuttle’s Cove kids club for the younger cruisers. Inner tubes, snorkel masks and fins can be rented from Gil’s Fin and Floats or Flippers & Floats on the beach, while kayaks, paddle boats, paddle boards and Aqua Trikes can also be rented for use in this water wonderland. Hammocks are located beachfront and very popular with visitors. And while my husband was clowning around in one with our grandson, that wily, notorious pirate Captain Jack Sparrow snuck up on them, grabbed our camera and started snapping photos. Carnival Cruise Line’s 2,124-passenger Carnival Miracle kicked off a year-round program of seven-day cruises from Tampa this weekend. The move doubles the line’s capacity at the port and further bolsters its position as the leader in Caribbean cruising. Carnival Miracle will offer the only year-round, longer-length cruise program from Port Tampa Bay, offering an unbeatable mix of destinations that appeal to a broad range of consumers, including families seeking an attractive and affordable vacation option. Carnival Miracle joins Carnival Paradise which operates year-round four- to eight-day voyages from Tampa to the Caribbean and Cuba. Together, Carnival Miracle and Carnival Paradise will carry an estimated 280,000 passengers annually from Tampa – the most of any cruise operator. 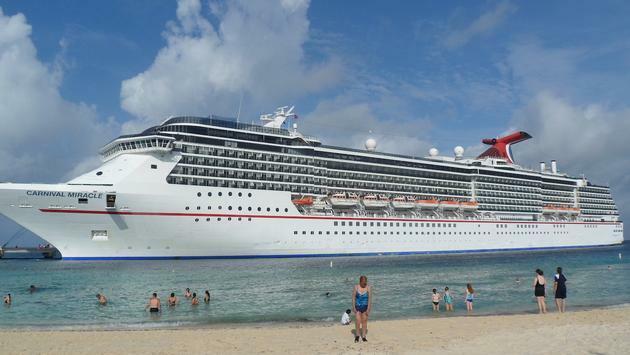 On its week-long Tampa-based cruise program, Carnival Miracle departs Port Tampa Bay Saturdays or Sundays calling at four popular western Caribbean ports: Cozumel, Grand Cayman, Mahogany Bay (Roatan) and Belize, each known for their world-class beaches, varied shore excursion opportunities, centuries-old historical sites and excellent dining and shopping experiences. These voyages from Tampa are part of Carnival’s exclusive Cozumel Plus program, which features extended stays that provide guests even more opportunities to experience and explore one of the Caribbean’s most diverse vacation destinations with a variety of exciting and unforgettable excursion choices, many taking place on Mexico’s mainland. Carnival recently added several six- to 14-day sailings aboard Carnival Miracle visiting spectacular ports throughout the Caribbean as well as an unforgettable opportunity to experience a partial transit of the Panama Canal. During the transit, guests will experience one of the Seven Wonders of the Modern World and sail on Gatun Lake, one of the largest man-made bodies of water in the world. The new six-day voyages feature day-long stops at Cozumel, Belize, and Costa Maya or Mahogany Bay. Departure dates include Sept. 2 and Nov. 11, 2018, and Jan. 27 and March 31, 2019. Eight-day Panama Canal cruises depart April 14 and Sept. 8, 2018, and Feb. 2 and April 6, 2019, and include a partial transit of the Panama Canal along with stops at Limon (Costa Rica) and Grand Cayman. There’s also an eight-day, five-port Caribbean cruise that departs Nov. 17, 2019, visiting Cozumel, Costa Maya, Mahogany Bay, Belize and Grand Cayman. Miracle will also offer a 14-day Carnival Journeys Panama Canal cruise round-trip from Tampa Dec. 2-16, 2018, featuring Cozumel and Limon prior to a partial Panama Canal transit followed by visits to Cartagena (Colombia), Aruba, Curacao and Montego Bay (Jamaica). Guests sailing on Journeys cruises enjoy unique local dining and entertainment experiences and a number of shipboard-enrichment activities. Guests sailing aboard Carnival Miracle can enjoy a wide range of onboard choices, the Caribbean-inspired RedFrog Pub, the cocktail pharmacy-themed Alchemy Bar, Nick and Nora’s steakhouse located atop the ship’s 10-deck-high atrium, a luxurious 14,500-square-foot spa, and a Serenity adults-only retreat. Of the ship’s 1,062 staterooms, 80 percent offer either an ocean view or private balcony. Family-friendly options include Seuss at Sea, an exclusive partnership with Dr. Seuss Enterprises, Hasbro, The Game Show, with larger-than-life adaptations of the company’s iconic games and complimentary programming for children in three age groups – Camp Ocean (ages 2-11), Circle “C” (12-14) and Club O2 (15-17).